Catch your zen when you're staying in Montreal at the Courtyard Montreal Airport! MONTREAL, QC--(Marketwired - Jun 3, 2016) - Guests seeking their own quiet corner of calm will find a redefined respite for wellness at the Courtyard Montreal Airport, as the property unveils its new Zen Room. Accessible for guests at both the Courtyard Montreal Airport and the Residence Inn Montreal Airport, this new, 24-hour restorative refuge complements the property's already state-of-the-art fitness center and indoor pool. The Zen Room offers guests everything they need to restore lost equilibrium by practicing yoga, pilates or light weight training. The room includes yoga blocks, medicine balls, aerobic steps, stability balls, dumbbells, adjustable benches and yoga mats. Open 24 hours a day, travelers have full control on when to practice their favorite activities without worrying about accessibility or restricting hours. 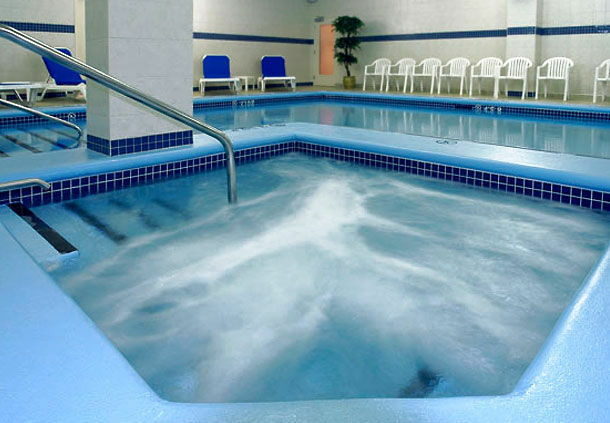 The hotel's large indoor pool is the perfect complement for guests looking to relax after their workour, including business travelers, families and sports groups looking for activities while traveling. "I am always looking out for what is important to our guests," said General Manager Mirella Alfiero. "And what came out the most is that our guests are now looking for workout facilities offering an invigorating atmosphere designed to help them attain an optimal sense of wellness. This is how the Zen Room was created." To help reach that ideal state of zen, the hotel, which is located near St. Laurent, Mirabel, and Pointe Claire, also offers healthier dining options while on the road. Traveling for business can be challenging, with extended hours on a plane and hectic agendas, so the property has revised its already popular menu at YUL Restaurant and bar. Foodies will find something to their liking with the restaurant's gluten free options, its selection of kitchen garden options or sandwiches offered on different types of bread, including gluten free bread. The hotel's table d'hôte menu is also revised every two weeks, so regular guests can enjoy a different selection every time they visit. For breakfast, the buffet selection includes an eggs and omelets station with a selection of fresh sliced fruits, smoked salmon, and soya milk, giving the Courtyard an edge among hotels near Montreal Airport. With a central location in Montreal, Quebec, only a short drive from Montreal Airport and close to many of the city's most famous attractions, the Courtyard Montreal Airport sets the stage for a convenient stay in the heart of the city. Whether in Montreal for business or leisure, guests feel at home, with spacious, well-appointed rooms, attentive service, and a wealth of helpful resources. Each hotel room features plush bedding, a flat-screen TV, room service, a mini-fridge and a large bathroom. 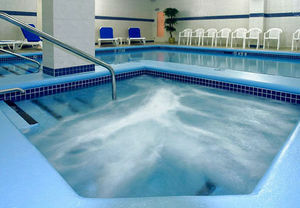 Hotel guests can also take advantage of an on-site fitness centre, a heated indoor pool, and delicious dining. If you're seeking a sophisticated backdrop for an event in Montreal, the hotel offers contemporary venue space and an accessible location near the airport; for your convenience, it also provides a free airport shuttle to all airport terminals.